When it comes to taking care of our furry best friends, nothing is too extravagant. Getting a water fountain for your dog may seem frivolous, but it serves to make sure that your pet stays hydrated with clean, safe water. But which one to choose? We’ve picked out the top 5 for you. I remember thinking that some pet parents were crazy before I adopted my first dog... and boy, how did my mind change! Now, I go all out to make sure my pet is happy, healthy, and pampered. One extravagance I tried out is a dog water fountain. This type of dog water dish keeps water filtered, clean, and circulating. Not only does this attract your dog's attention and encourage them to drink more water, but it’s also healthier. 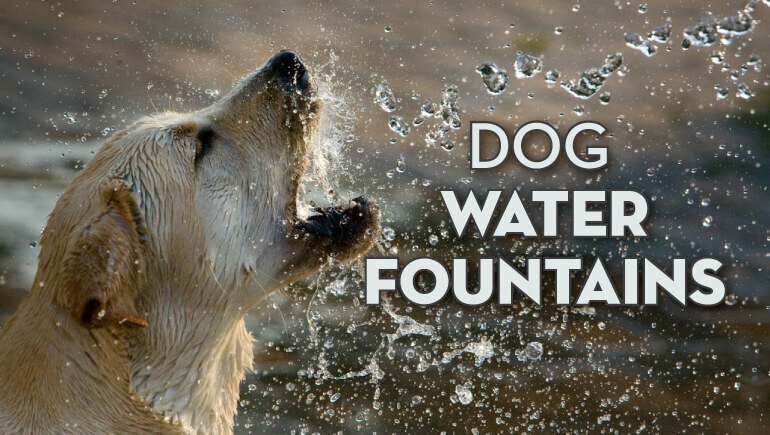 The best dog water fountain can ensure your dog is drinking fresh water while also allowing dogs to drink as much as they want without you needing to fill their bowl as often. While not right for every pet, the best pet water fountain could be right for yours! The Drinkwell 360 is one of the best pet fountain options you can find on the market in 2019. 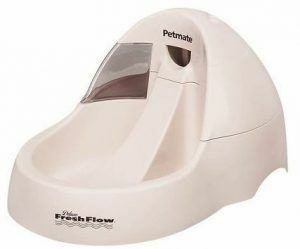 This fountain provides fresh, filtered water to your pet, and there’s a number of different options that you can customize to fit the preferences of both you and your pet. 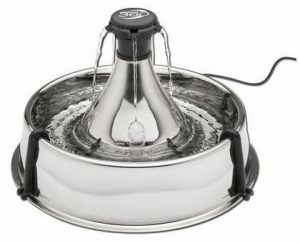 The fountain holds up to one gallon of water, and you can choose between five different stream options to choose what will be most enticing to your pet. You can also prevent splashing by adjusting the stream. The system is dishwashable, making it very easy to clean and care for. One final benefit of this fountain is the rubber feet on the bottom. These feet help to prevent any potential sliding. Some dogs may want to swat at the water when you first get the fountain, so these feet are essential. 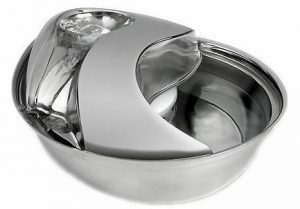 The Pioneer Pet Drinking Fountain's Raindrop Design is one of the most gorgeously designed pet fountains that I’ve ever seen! In fact, I don’t mind if this is somewhere my guests can see it - I want them to enjoy the unique design! This particular fountain can hold up to 90-ounces, so you will spend less time refilling the fountain and more time playing with your pets. The fountain itself is also made of stainless steel, which resists bacteria buildup and helps keep water fresh. The charcoal filter in this fountain should be changed monthly for best filtration results. 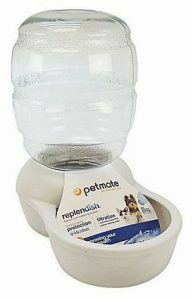 The Petmate Deluxe Fresh Flow has long been considered the best dog water fountain. While I’ve placed it in third place due to its out-of-date design, there is no doubt that this is one of the most functional pet fountains you will find. This fountain comes in three different sizes: 50 ounces, 108 ounces, and 216 ounces. Depending on how many pets you own and how large they are, you can choose the right capacity to make water refilling easy on your family. The no-splash water slide is constantly circulating. This both attracts pets to drink more and keeps the water fresh and cool. Your pets will drink more thanks to this fountain! The Drinkwell Original Pet Fountain is one of the most classic pet fountain designs around. This fountain features a small stream of water that goes down into a more classic bowl design before being filtered and recirculated. A removable carbon filter can be replaced monthly to continually remove any bad taste or odors that we pet owners are used to developing in a non-circulating pet bowl. This particular fountain doesn’t splatter. It does make a small amount of noise, but this noise is not loud enough to be a disturbance for most pet families. Try it for yourself to see! 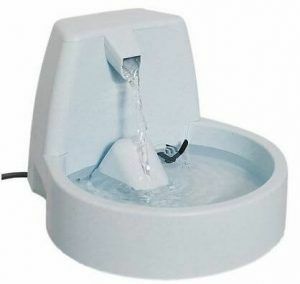 The final pet fountain I’d like to introduce is a simple design that is less of a fountain and more of a never-ending supply! The Petmate Pearl Replendish Waterer features a water cooler type feature - as your pet drinks, more water will be added to the bowl. It’s important to note that this type of pet fountain is non-circulating, so the water inside the bowl can become dirty or stinky if your pet does not drink quickly. There is a filter in the bottom of the cooler that helps to eliminate potential pathogens from the water before it enters the bowl, but water in the bowl is not ever refiltered once it enters the bowl. None of these are as pimped up as this fountain, though! 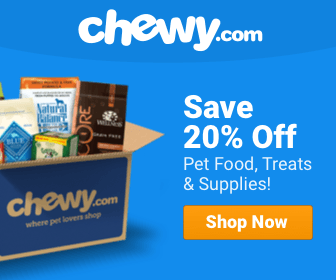 Have you found the right pet fountain for your pet? I hope so! A water bowl that doesn’t need to be constantly refilled or cleaned out can help your pet to live a healthier, more hydrated life. 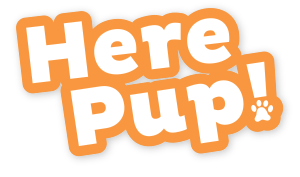 Plus, caring for your pet will get a bit easier, too! No matter what type of bowl or fountain you choose to use for your dog, always make sure that your pet is properly hydrated, as water is a key part of their diet. What do you do to ensure your pet drinks enough water? Lend your tips to other owners like me, please!